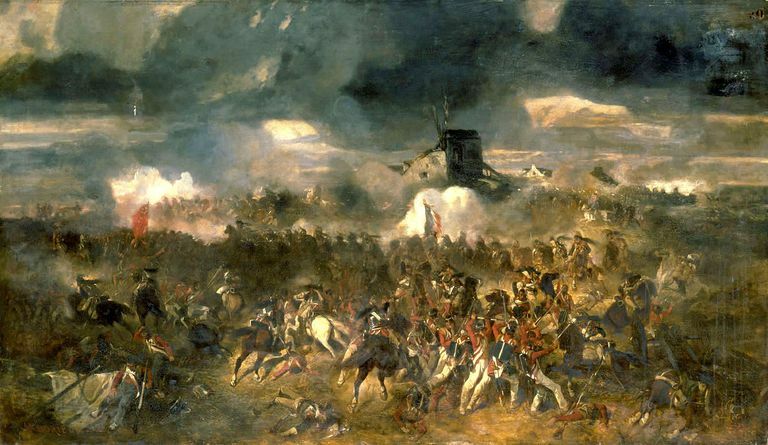 Oil painting "Battle of Waterloo. 18th of June 1815" by Clément-Auguste Andrieux. The battle of Waterloo, fought all day on June 18, 1815, is one of the most famous events in Europe's entire history. Although the climax of the Napoleonic Wars, the battle is sometimes examined as an event in its own right. The 200th anniversary of the Battle of Waterloo produced a lot of new works, and this is a cracking one: a narrative history of the key four days with all the verve and skill of a story and the analysis of a historian. Put aside an afternoon, and enjoy this tremendous event. Bernard Cornwell has written a Sharpe adventure about the battle of Waterloo, and here he brings a novelist’s eye to the history. Clayton’s book above does not lack for drama and speed, but Cornwell’s style has created a popular history which has found widespread appeal. A fascinating book which looks at what happened after the battle in much greater detail than the usual ‘no more Napoleon, see you for the Congress of Vienna.’ Obviously, don’t start with this book, but do fit it in after you’ve read others on this list. This is eighty pages of text on the battle for the farmhouse of La Haye Sainte. Does Simms convince that these men won it? Maybe not, but as a look at one part of the battle, it’s excellent. Obviously, a broader book will provide context, but this is worth the couple of hours to nip through. A concise narrative, clear maps and full color pictures of the various combatants combine to make this a good introductory book on Waterloo. It doesn't tell you everything or give you much idea of the many debates that continue today, but all ages can enjoy this smart volume. English language works on Waterloo have, in the past, focused on the Allied army. Field has dived into the French sources to look at the other side of the battle, and argues for conclusions at odds with other writers. It is a worthwhile second volume to read. Uniforms of Waterloo is a superb achievement, cramming in a formidable level of detail and art for the low price. Using 80 full color plates, a few line drawings and over 80 pages of text, the authors and illustrators describe and explain the dress, uniforms, weapons and appearance of Waterloo's combatants. This is a well-written and measured account of the whole hundred days by one of the world's leading military experts on Napoleon, David Chandler. You may not agree with his conclusions, but he does outline the key areas of debate, and a selection of excellent maps and black and white pictures round out a good narrative which is slightly more than an introduction. Combining acute and detailed analyses with a multi-lingual examination of often overlooked sources, Hofschroer's two-part account of the 'Waterloo Campaign' is profoundly revisionist and has upset more than a few traditionalists. Volume One covers the earlier events. Part 2 of Hofschroer's monumental study is considered to be slightly weaker than the first, because of a misjudged balancing of sources; however, as most accounts contain an over-reliance on French and English documents, the focus on Prussian material is welcome. If you’ve read a lot on the battle you owe it to yourself to enjoy this exuberant tale: how the news of the battle was taken to London in a time before phones and telegraphs. It’s the sort of fun history, filled with little details, that can convert people. The title explains why this is an interesting book: ‘Voices from the Battlefield’. Kershaw has mined down to the first person accounts we have available and has filled it, with hour by hour coverage, with interesting vignettes. There’s some analysis from the author. Regarded by some as a classic and informative text, and by others as an exciting, but flawed, account which accepts too many myths, Weller's book has divided opinion. As such, I would not advise this to a beginner in the subject (the volume is also too detailed to be an introduction), but I recommend it to everyone else as one component of a large historical debate.